This will be my last article from Texas as we will be heading home in the next few days. Most of the snowbirds, both American and Canadian, have gone north to their respective permanent residences and, as a result, this last week has been rather quiet around here. Much like the birds my wife and I are anxious to head north also but for different reasons. On the eve of March 29 we had a whopper of a thunder storm that lasted for over two hours and dropped a reportedly five inches of rain. In nearby McAllen their storm was worse with tornado warnings to boot. There, the high winds tore down some trees and severely damaged some of the awnings on trailers and motor homes. Time to go home. Our trailer park is quite well treed and, as a result, we have a lot of birds in our yard. With the nesting season in full swing birdsong (in some cases “birdsquawk”) is everywhere. It certainly is enjoyable. The constant chirping of one lone cricket just outside our bedroom window is very soothing and brings back many pleasant memories of summers in Saskatchewan. This week I am writing about a bird that to my knowledge has not been recorded in Canada. The Yellow Throated Warbler spends the winters from the southern parts of Texas and Florida to the tropics. Two winters ago a male Yellow Throat spent the entire winter in the Frontera Audubon Thicket in Weslaco, TX and we saw it just about every time that we went into that thicket. In summer it breeds in the eastern part of the US from the Carolinas to just south of the Canadian border in Ontario. Being a migrating bird that nests so close to Canada, one would expect it to show up in Canada at least occasionally especially at Point Pelee. Perhaps one day it will, if it has not already been recorded. 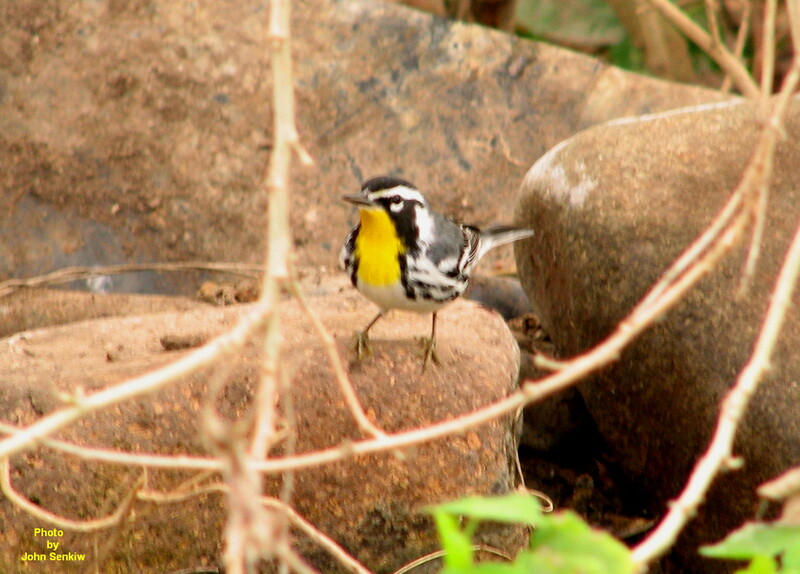 This week’s photo of a male Yellow Throated Warbler was taken two years ago at a water feature in the Frontera Thicket. It came in for a drink but wound up taking a bath also. The bright yellow throat and sharply contrasting black and white body are really clearly visible in the colour photo.